For the very lowest sun elevations there are only two photos, both shown here. Four uppermost images are versions of the same photo, which was the last one taken that day. 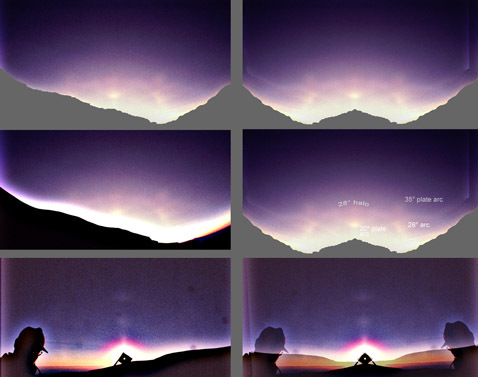 Because halos have turned reddish, I suspect the sun was already below horizon. Again a new feature has appeared, the 35° plate arcs. Others are familiar from previous postings. To avoid wash-out from unsharp masking, ground was removed. For comparison, in the image on the middle left, the ground has not been removed. Same amount of unsharp mask and levels has been applied to both versions. Photos at the bottom are from 1.6 degrees sun elevation (not to scale with upper photos). Two arcs directly above the sun are 20° upper plate arc and "Moilanen arc". From this slide the latter was measured to be 12 degrees from the sun. Excellent series! I was waiting for these last additions with the 35 plate arcs. If ever there was an enigmatic display, this Lascar spectacle has got to be it.